The easiest no-sew window valence ever! The easiest no-sew window valence ever! Who’s ready for a seriously easy way make a window valence? You don’t even need your sewing machine for this one people! If you know me well, you know that I’m a huge fan of mixing and matching fabric patterns so when I was designing this room for my little lady I went with a very pale purple on purple stripe on the walls and then added a big shot of pink with the crib bedding I chose. 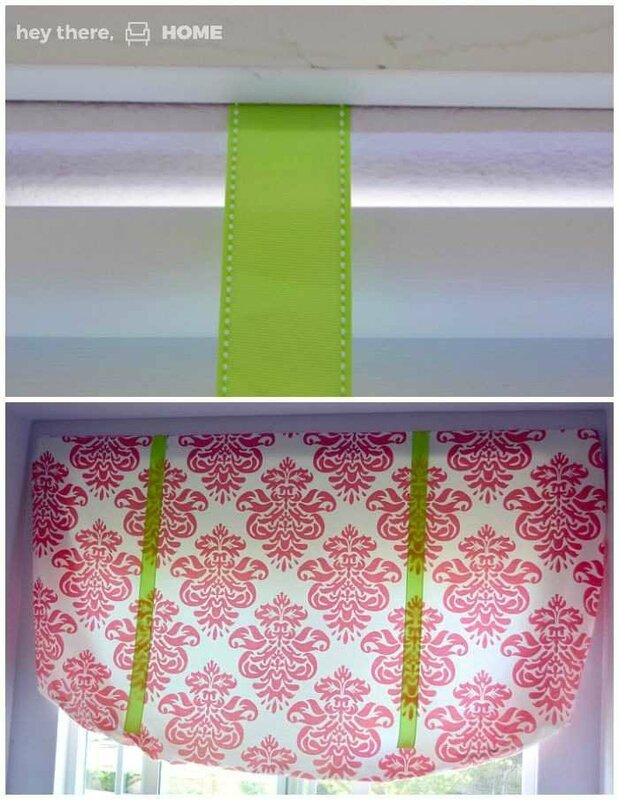 The sheets for the bedding came in polka-dots and this damask pattern and I ordered one of each cause my pregnancy brain could not make a choice for the life of me! That ended up being a good thing, because although I went with the polka-dots for the actual crib sheet, this damask crib sheet ended up becoming this ruffled valence in less than 20 mintutes. 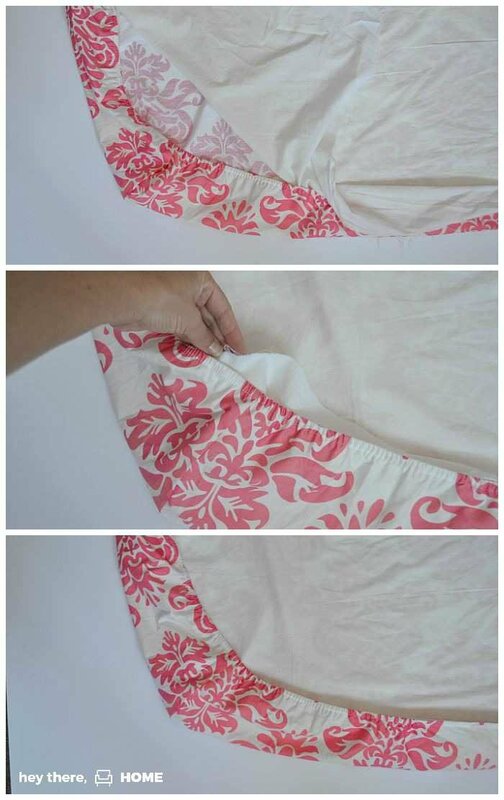 (optional) a scrap piece of fabric like an old white sheet to use as a liner depending on the darkness of your crib sheet. Step 2: Predrill holes in your board. 3-4 for a standard size window should be plenty. Step 3: Cut the elastic off of one long side of your crib sheet. 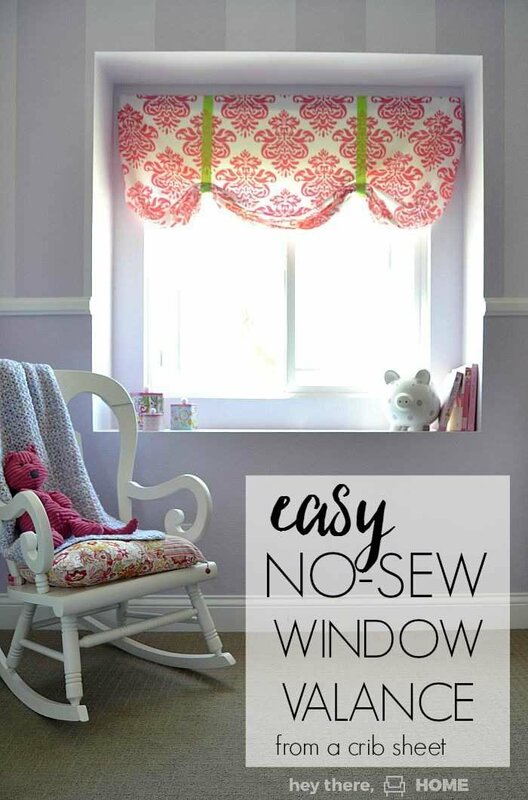 If you are lining your valance, you will also need to cut a scrap piece of fabric about the same size as the crib sheet. I used an old yucky white sheet for this. 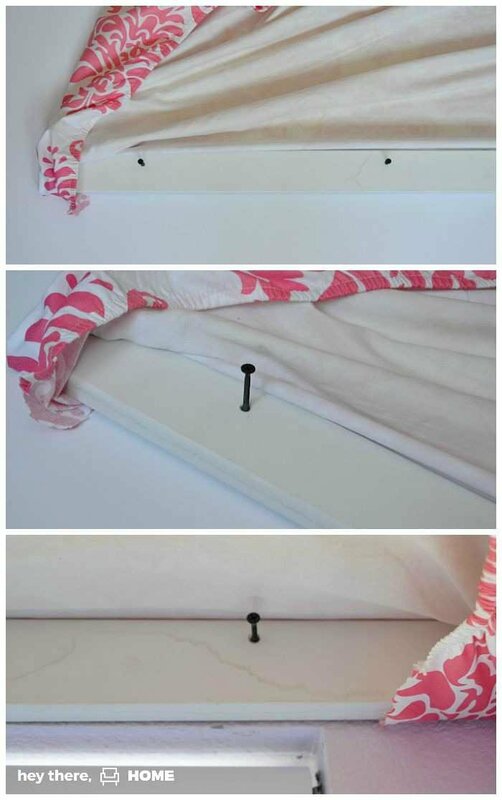 Step 5: Once your sheet and lining are secured to the board, simply tuck the bottom edge of the lining into the corner pockets of the crib sheet. Step 6: Now flip your whole project over and lift the fabric part up and over so you can see your board again. Using your predrilled holes, start each drywall screw in each hole making sure not to go through the entire board. Step 7: Now grab a buddy and hold the board up above the window. Check to be sure it is level and finish screwing the middle screw into the wall. Step 8: While your buddy holds the board, feed your pieces of ribbon around the backside of the board. Be sure to place them evenly from the edges of your board and avoid your screws. Pull them so they are pretty much even. Tip: If you want to have bows on your finished valence, pull your ribbon so that the back is longer. If you don’t want any bows (like mine) pull your ribbon so that the front is a little longer. Step 9: Finish drilling your screws into the wall to secure your valence. Step 10: Tie each ribbon to create your ruffle. I tied my ribbon in a knot behind the valence and tucked in the excess. If you want to have a bow, be sure to do your bow on the front side of the fabric. 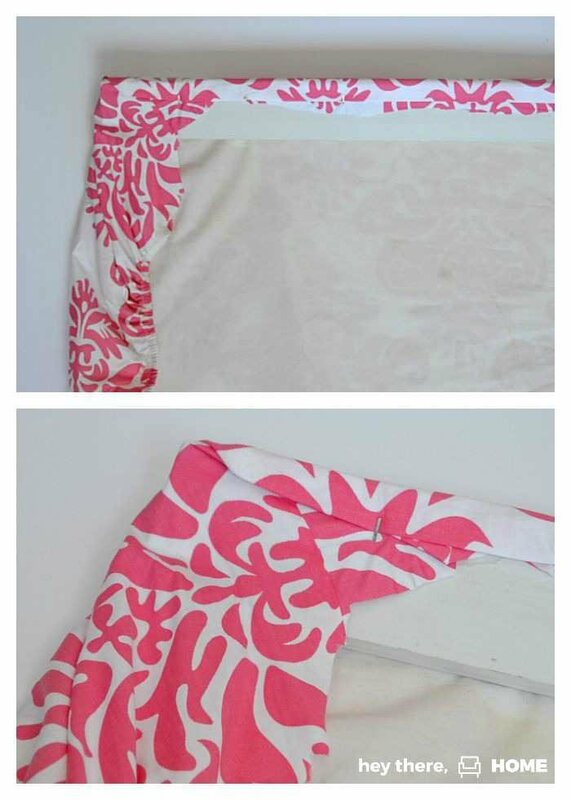 Give your valence a little tweak to get the fabric to lay just right and that’s it! A super cute ruffled valence that requires absolutely no sewing skills what-so-ever and a little peek at my little girl’s room, which I’ve never shared before! Happy no-sewing and have a great day! Love this idea. But where does one find such a lovely crib sheet? Hey Theresa, I got mine on Amazon and link to their crib sheet selection on the supplies list above (click on “fitted crib sheet”). 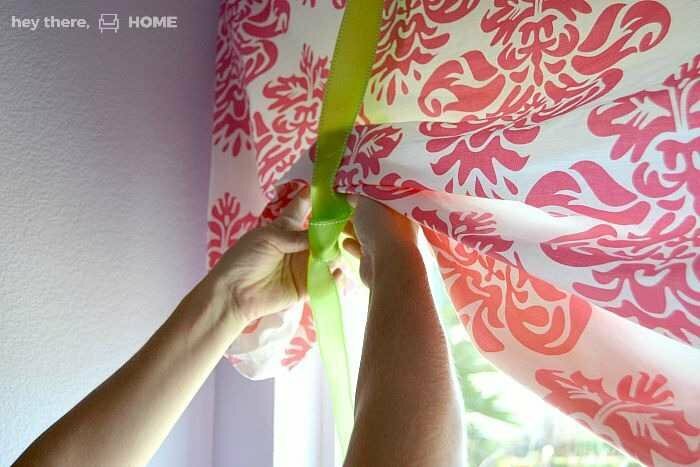 Wonderful valance idea! Thank you for sharing. I made one for the kitchen and one for the children’s bathroom and installed them in less than one hour! So awesome, Linda! Thanks for sharing your success! This is so much easier than I would have thought. I have a window in my hallway that would be perfect for this idea! I love that you also love mixing fun patterns and colors, the ones you’ve chosen would fit perfectly in the mixed patterns I have in my house. Thanks for sharing!